There was a trainee teacher on my last CELTA course who had come to us without any academic background to speak of but with a wealth of life experience; in the end, he turned out to be one of the most interesting trainees I’ve worked with. I would like to share a particular story involving him which raises some questions about our profession and professional training. T: So you were a sailor, then? T: Scaffolder, you mean you put up scaffolding? T: I saw them doing that down the road here, it went up so fast! D: Ah monkeys could put up the stuff they use here – it’s all pre-fitted, you just snap it together. Back home we use what you call tube and fit, just plain piping and nuts, much more flexible. D: Yeah, here, you just use these kits, y’know? T: But what’s wrong with that? D: You can’t do anything special with it. OK, it’s easy, but you can’t, for example, if you’ve got something round, like a chimney, you can’t build a circular scaffold with that stuff, it’s rubbish. T: So what do they do? D: Best they can – you end up with big gaps between the sections, blokes throwing stuff over, jumping across. It’s not safe. D: Yeah, I mean, a scaffold – a real scaffold, tube and fit, it’s,… I mean, it’s beautiful to look at, it’s art. Inside a huge tower, for example, with a proper fitting scaffold going all the way round inside. Perfect, no gaps, smooth. That’s beautiful, that is. D is here making a case against using materials for scaffolding that are too specific. He argues that, to be flexible and to be able to fit the local circumstances – literally, to adapt to the contours of its environment – scaffolding needs instead to be as raw as possible. Tube and fit – two elements with which an almost infinite variety of needs can be met, given ingenuity and skill. The other, superficially more refined kit system, while being faster and easier to work with under certain conditions, quickly reaches its limits when needs become more than basic. Might this also be the case in our field? Mass-produced courseware, no matter how well-intentioned and no matter how well-designed, cannot possibly claim to be tailored to any given learner or even class. Therefore, any class using mass-produced courseware is necessarily engaged in a compromise – in terms of linguistic content, topical relevance and theory of learning. 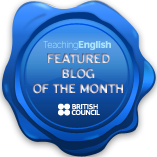 Recent blog posts criticising teaching unplugged have suggested – amongst other things – that asking teachers to custom-build material for their learners or respond flexibly to emerging circumstances is unreasonable: that may be. However, that is only because of a flawed concept of education and how it is acceptable to go about it. If we take an industrial model to education, it will lead to perceiving such individualising effort as either inefficiency or unjustifiable strain. This reveals only the inadequacy – the lack of fitness for purpose – of the industrial model of education, because education must always be a tailor-made solution, or as close as we can get to one. Education theorists like Ken Robinson have been pointing out the inadequacy of the industrial model of education for some time now, and they haven’t been the first. Decrying efforts to move in this direction (as teaching unplugged tries to move) as inefficient or unreasonable in the light of current “realities” does not actually stop those efforts from being nevertheless right. Further, the criticism that expecting teachers to be(come) adept and practised in using raw materials rather more than in maneuvering pre-fabricated materials is expecting too much of them – could be said to stem from or lead to an impoverished view of what a teacher actually is. Ingenuity and skill are what using raw material well requires – in scaffolding buildings and in scaffolding learning. Skilled professionals take time to develop and are expensive to maintain. It is therefore economically easier to economise work processes by making them “idiot-proof”. This can be observed in the fast-food industry, where the process of creating a meal, once the preserve of skilled chefs, has been reduced to an industrial, production line process so simple and mechanistic that the worker is completely replaceable. This leads (indeed, is designed to lead) to downward pressure on pay and this leads, in turn, to a downward pressure on the felt and perceived level of professionalism of the job: a fast-food worker does not enjoy the same professional respect or benefits of a well-skilled chef. Might the same be true of our profession? Might the widespread use of pre-fabricated course materials, whatever their short-term pragmatic benefits and the potential for using them in a principled manner notwithstanding, still inevitably lead to just this kind of de-skilling and de-professionalisation in our field? The metaphor of scaffolding has found a place in Western education theory since the discovery of Vygotsky; this much is old hat. The question is: how much focus is there really on initial teacher training courses on how to scaffold – really scaffold – learner talk and learner learning? D’s criticism of “scaffolding kits” which appear to offer quick and convenient support for workers often leave alarming gaps which have to be dangerously bridged. At best, there is an awkward fit between the structure in progress and the scaffold ostensibly there to serve it; at worst, the scaffold presents a danger to those using it. Are there parallels to be drawn here to a teacher’s attempts to scaffold their learner’s discourse when the teacher has a only superficial grasp of what scaffolding actually is and what it requires in order to be supportive and effective? Do popular training courses spend sufficient time not only on discussing the notion of scaffolding, but also on working intensely on developing competence in doing it? In short: do ELT professionals have some lessons to learn from a different kind of scaffolder? Hi Anthony. First off, congratulations for your acceptance for IATEFL 2012. Look forward to seeing you there. Hope we’re not presenting at the same time! The word scaffolding is battered around a lot and I’ve come across a few instances of exemplification in ELT literature, none of which have really and truly helped me build up an idea of the when and the how of scaffolding. I have to admit you beat me to the point with this post; I was going to write up one myself this weekend on how I scaffold, defining it within my parameters and how I think it helps my learners, in the hope of obtaining some feedback from the PLN-world on the same things you mentioned in your post. Is there an issue at play here thought with a one-size-fits-all scaffolding? If the idea is to provide support for speaking/learning then it depends on the difficulties students have in that situation as to what shape the scaffolding takes. Should we be teaching flexibility and reflection alongside possible techniques? Live classrooms or recordings of classrooms to encourage teachers and trainees to consider what type of scaffolding best fits the needs of the students could be an option. A difficult notion to put into practice, even more difficult to guide trainees on. Thanks Dale, and those congratulations right back at you! I hope you do write about this and about your concrete experiences; I think it would be a very rich addition to this topic, which, as you say, is often dominated by theory and less by reports of practice. I do not think I “guide trainees” particularly well on this at all – and writing this post has made me think about this even more acutely. All help gratefully received! Really enjoyed this, Anthony. Thanks ! I loved how the scaffolding anecdote bloomed into a metaphor for ELT. Honestly, it could serve as a metaphor for our modern culture in general. Comfort, convenience, efficiency, one-size fits all… all of this disregarding the environment. I think it’s important to be aware of it, to share these thoughts and then to choose a direction that seems ‘healthier’. Thanks Brad – I’d love to hear how I’m doing that too! truth is, though: I suspect I’m not, or at least, not anywhere near as much as I’d like or as what’s possible. This relates to a recent comment by Derek and others about listening, responding and taking advantage of affordances. Need to write about this. I am fascinated by the analogies we use! A bunch of Scandinavian film makers have a 2-year experiment and then give up on it! Not a terribly good analogy, perhaps….! I do think that scaffolding works well as a way of teaching and training – when people understand what it means (the breaking of tasks into small steps, support etc), and of course unpluggedness is entirely attractive, especially when teaching one to one. Individually targetted scaffolding gets more difficult as the numbers increase. And unpluggedness, for me, isn’t the whole answer. Some learners (and they are who matter) do like books, however much you – their teacher, with your own entirely acceptable (!) prejudices – doesn’t. Coursebooks are incredibly useful for teachers all over the world. The mark of a good teacher (if they use a coursebook) is HOW they get students to deal with it. IF is far less interesting for me. When I did my 4-week course way back in the last century there was no input about coursebook use. Ever. We were unplugged the whole time. I felt then – and continue to feel – that this was a fault of the course. I have taught and trained unplugged and plugged; I find it difficult to say which is, of itself better! And if it’s analogies we are after, which version of Layla do you like?!! Hello Jeremy – thanks for taking the time to write! While this may seem perverse, I’m going to agree with everything you’ve said and still argue with it, OK? Firstly, what interested me is that this teacher wasn’t “harking to an earlier time”; he was comparing two contemporary ways of working (his work in this field lies only a few months, if that, back, as far as I know). So it’s not so much a generational gap but perhaps a cultural one. In Germany, tube and fit is not widespread; in the UK it is. The reasons for this are unclear to me but I can make a good guess – and some of the reasons may be as noble as those he put forward. In the UK, though, it might also simply be motivated by a “make do and mend” mentality which disguises unwillingness to invest! Not a noble motive, and one you would be right to question. And I’m all for convenience and taking the line of least resistance; that said, there is a difference between convenience and fitness for purpose, isn’t there? We are probably in agreement that no materials are fit-perfect; equally, I suspect we are in agreement that working with the rawest of raw materials isn’t always the right solution either (sticks and mud, anyone?) I just think that, from a training perspective, and even from a general everyday teaching perspective, that spending more time thinking about how to make more of less is a good idea (I suspect you would also be in agreement with this, as long as I have been clear enough that this does not mean abstaining wilfully from exploiting all the richness out there). I agree that I as a teacher have no right to deny my learners resources simply because I may be convinced of their superfluousness at best and their constraining damage at worst (this is not, actually, my belief, by the way, when it comes down to it). However, I do think that there is also a case of “nature or nurture” argument here too: do we like coursebooks because they are genuinely positive for our learning or because we have become accustomed to their presence – their iconic status as talismans of learning? Your sense that your 4-week course (taken at a time when this abundance of today was still to come, of course) would have benefited from some inclusion of this missing element is clearly valid: other things remaining equal, more is better. Of course, other things don’t remain equal, and since your training, pre-fabricated courseware, combined with more focus on activity than concrete teaching and getting to grips with language, as it were, may be leading to an impoverishment in one area of teacher competence at the very moment it better equips us in others. It’s about balance, and balance, as we know, is not in fact a stable state, but an inherently unstable one, with movement central to its attainment. So I suppose what I’m saying is that we need these tensions in our field, as “without contraries is no progression” (W. Blake). And yet… as a teacher trainer working in a time and place of Überfluss (lovely German word, that, meaning both abundance and excess, showing once again that this is really a matter of perspective and attitude), I am still convinced sufficiently of the benefits of focusing on making more of less than making more of more, to persist a while longer in getting to the bottom of it. Perhaps when I do, I’ll realise that it’s really not about what you’ve been given, but what you do with what you’ve got. Thanks again for stopping by – don’t be a stranger! Admittedly, I find it much more rewarding to create lessons from scratch after having listened to my students – and so do they. They really appreciate it. And it gives me the freedom to more easily adapt to upcoming situations in the classroom. (b) I think – as with all students – that there are different types teacher trainees, too. And for some of them, to gain the necessary confidence in their job at the outset, it might be helpful to ‘go by the book’ and by doing that to have something to cling to before being able to progress from that to being ‘artists’. That leads me to the conclusion: Developing teachers might need an inbuilt progression (just like many coursebooks have – not tailor-made as they might be) – from working with course book materials to letting go and becoming DIY specialists. And a PS: Particularly with elementary students I feel that coursebooks are very useful, indeed. How much unplugged teaching do they need when they don’t understand a thing the teacher says. It seems to me that for them, too, a coursebook (if well chosen) provides something they can cling to. I’m not sure though of the logic that elementary students benefit from coursebooks as without them they can’t understand a thing the teacher says – I mean, if they can’t do that, how will they understand the coursebook? especially if you add literacy into the mix and they can’t read the script? And as for weaning oneself off materials – I know that this is what I’ve done in my work, but it’s taken 17 years! I wish I had been shown how to work from first principles earlier (If I knew then what I know now…) Of course, there’s no perfect way round for everybody – so let’s keep tinkering! I would love – dearly love – to be able to devote my time in the classroom to putting up proverbial scaffolding in the good old way to take care of those slightly off-angle students and carefully construct a framework for each class so that everything is in reach and all nooks, crannies and angles can be covered. But it’s never going to happen. Quite simply it’s a matter of time and resources. I could spend a good hour preparing each class but that would simply result in my work load being doubled and burn out; not to mention the lack of support from above. And then of course we shouldn’t forget the student’s point of view. Whilst there are many, many students out there who are looking for something special, most are heading towards a standard exam and need to know standard things. In other words, they are the square buildings around which standard scaffolding fits perfectly well and does a perfectly good job. It won’t cover all the gaps, but standard textbooks will get most students to most destinations in a reasonably comfortable way. As you say, what is needed is a massive change in mindset with the way English is taught. Then, perhaps the artisan in us all could make a comeback. But it’s not going to happen. IKEA and McDonalds are here to stay and they will take the lion’s share of the market, not the skilled carpenter and chef. Feel free to mix metaphors! From a utilitarian perspective, close enough for most is a valid benchmark. What you say about circumstances vitiating against the kind of ideal I have in mind is also absolutely valid, of course: but we can dream, can’t we? what is needed is a massive change in mindset with the way English is taught. Then, perhaps the artisan in us all could make a comeback. You’re right about one thing: a massive mindset is needed – but I think that it is in fact happening. Granted, its beginnings are small, and granted, the chances are there won’t be a paradigm shift in my lifetime, but for this shift to happen, we don’t actually need to topple any corporate-like giants – we need to shift values in society and from there, in government. This is not impossible – it has happened in different areas of life many times over, often with surprising speed once momentum has been gained, and there is really no reason to suppose that it cannot happen in education. That is, unless we (as individuals and as a collective) abdicate responsibility for “being the change we want to see”. Claudia what a great quote, “in built progression” – spot on. Coursebooks provide scaffolding: for students and teachers. That’s why elementary students really appreciate them and why teachers find comfort in their structure. Nevertheless, it takes a teacher first to notice the scaffolding a coursebook provides and then to consider how best to use it; it doesn’t construct itself. Which leads me to my next point. Unplugged, plugged-in, finger in the mains socket or in charge or the generator, scaffolding doesn’t finish with the book/a task/an activity; a teacher is hard-wired to the classroom to detect when learning, as opposed to teaching, takes place and the if and the when of support. Training again – is this teachable? Is the whole English language teachable in a 4-week course? Let’s not get too hasty! But hey, it’s definitely worth input on, live action of teachers using scaffolding and gathering trainees opinions on its effectiveness. I guess by putting trainees on the right path with an awareness of scaffolding, how it can work and why it can be useful, you introduce them to a concept they can go away and develop. Now I am more aware of it, it shows up a lot more in my journal, my planning. I consider it when looking at material, thinking about the application of an idea to my learners. Quite right, Dale: you can’t do everything in a limited amount of time, whether that be 4 weeks or 6 semesters. But if we could find better ways than I suspect we have at present of helping new teachers spot scaffolding in action and gain general principles and basic practical strategies from it, we would be doing something well worth dropping some other typical input to make space for it. As for quotes: “scaffolding doesn’t construct itself” is a cracker – wish I’d thought of that! Another interesting, well written and thought provoking post. You have picked a huge area to tackle. I’m far from being an expert on the subject and like Dale mentioned, it’s hard to get an idea of what scaffolding actually is. I guess I see it as the pathway to guide the students into their ZPD. But like anything with learning, scaffolding is very personal and individual. Any teacher would be hard pressed to cover every student’s own needs. I think this is why perhaps we use the ‘mass produced courseware’ as you put it. Creating specific materials for any class can be time consuming, the thinking time behind these materials also takes a long time. Unfortunately, time is something teachers, especially in my own case, don’t have. I think the ability to react within the class, to the student’s reaction to the materials would be something to work on. I don’t see anything wrong in allowing the students to use the materials they are given in any way they see fit as long as it helps them to learn. Or even spending a lesson or part of the lesson getting the students to create there own materials. Getting feedback on what they think works or doesn’t work. Improving and reshaping them as you go. Student centered teaching leads to emergent language. Why can’t it lead to emergent materials? It takes some of the pressure of the teacher. I hope I haven’t missed the point here. Agreed Adam: time is something that teachers are often pressed for. I suppose this is one of my ongoing problems with education – its vast importance socially and economically versus the amount of investment given to it (relative to other, more destructive national spending). So I am aware that what I am crying out for is not, in any absolute sense, likely to happen overnight. And as you (and Jeremy Harmer) have both pointed out: it isn’t what you’re given, it’s what you do with what you’ve got. As you say, making something of the emerging moment, using whatever is available to help you do this, is teaching. Learning how to do something that, as you and Jeremy have both also said, is transient and ephemeral, and therefore difficult to rehearse or generalise from – this is the tricky part. Which is why I think teacher trainers and educators should give this some serious thought – with the starting point that it is possible. Because it has to be. And the idea of emerging materials that you mention reminds me of this epic article by Adrian Underhill, who describes exactly that. Thanks for the reply Anthony. The Adrian Underhill article you mention, is actually printed out and stuck on the wall of my project class. Very inspiring. I guess the emerging materials part become lodged in my sub-conscious somewhere. I love the idea of that article stuck up on your project room wall, Adam – has something of “Unplugged Mission Command” about it! But to be serious for a mo: have you done any work with your project group so far that resulted in emergent materials? I’ll have to go back and read your posts again! As always – a fascinating thought provoking post. I know I run the risk of repeating myself, I think the teachers themselves provide the “rounded edges”, changing the scaffolding they are taught to meet their needs. In my work as a teacher counselor I see this over and over again – even if we’ve discussed some very specific way to do things or the trainee has watched a lesson of mine, it is NEVER done the same way. Teaching is not prescription medicine. Also, the more I read the more I feel that one can teach in a DOGME like fashion when one has a toolbox full of strategies to pull out as needed as things develop in class. It doesn’t seem to be a contradiction, at least they way I see it. Quite so, Naomi: Dogme isn’t about working in one way or another (on the level of technique) but instead of working in one mindset or another. Basically, though, the most direct route, which will typically involve the least amount of pre-fabricated learning material (as opposed to other likes of more authentic material), is going to concord most closely with that Dogme mindset as I see it. Not that this, however, matters at all at the end of the day: good teaching is good teaching, whatever its mindset! And finally I find some time to comment on this thought-provoking post. I spoke to the trainees on the last course about scaffolding quite a lot. It first came up when we were discussing how to tackle a reading text in class. I introduced this idea of “funnelling” as I like to call it. Basically, going into the text in steps – first (as Scott talks about today over on A-Z), a task which allows them to understand the main idea of the text, then something a bit more concentrated on specifics within the text (but still meaning based), and then perhaps a focus on language/discourse features that are present. I like the analogy of funnelling because it implies focussing in closer on something, and I believe it is a form of scaffolding, which implies a support structure that enables one to reach a higher plain than would be possible without it. I saw the trainee D actually talk to the students about scaffolding in the middle of a grammar lesson when he realised that they didn’t get the target language. He stopped them all and said “Oh, right, you guys need some more scaffolding here, don’t you? Let’s come back to the board.” Just as I am sure he did on the building site when he realised that the structure needed some more tubes added to make it fully-safe/usable. Let’s talk about how to get more implicit focus on scaffolding into input, Anthony. I think this extra anecdote you tell here captures true Vygotskyan scaffolding. In an emerging moment active steps are taken by the more competent other in direct response to the apprentice’s perceived needs, all occurring in real-time. How to help beginning teachers get more of a feel for how to do this (and more courage to do it!) – that is the question. Yes, let’s talk. I’ve been meaning to add a comment to your blog post, but was waiting for a moment of peace and quiet in my house…..
Scaffolding is something which I firmly believe in, for any teaching/learning situation. Yet, the more I’m involved in teacher training/development, the clearer it is to me that this is a term which is bandied about with a lot of enthusiasm but without clear understanding of what it “concretely means” in a teaching context, as you rightly mention. I believe that most scaffolds in the classroom are “raw” and emerge from the need of the learners at that given moment. In fact, they emerge from the dialogue between teacher and learner. They are tailor-made scaffolds, created by the teacher in order to bridge a learning moment (or when we get learners working in groups and pairs, they actually are great at creating their own scaffolds to get on with the task at hand, provided the task is stimulating enough), as in the example provided by Jem of your trainee. We literally put up scaffolds and take them down when they are no longer needed. Yes, because another thing I think we often forget is that scaffolds are temporary structures and should ideally be removed or at least re-built to suit the changing circumstances. You´re right, scaffolding is often dealt with in abstract / theoretical ways and rarely pragmatically in teacher training courses. I observe many teachers during a year and notice how difficult it can be to understand how to scaffold learning (this is true both of more and less experienced teachers). I think that to be able to “capture” a moment when you need to scaffold something is not always as clear as in the example with your trainee (blank faces always help immensely, but with teenagers who want to save face, this can quite easily be hidden from view and you only notice it later on). I like using post-lesson observation moments to share/ discuss with the teacher any examples of where scaffolding may have been necessary but wasn´t done. Sometimes it´s a question of awareness-raising. However, there are things we pick up faster, there are things that we need longer to understand. I don´t think that the ability to scaffold is necessarily related to how much experience you have, I think it has a lot to do with how open you are to listen to and look at your learners (though I understand that with classroom-size constraints, such as those we have in state schools in Brazil with over 50 students, there is a limit to which you can scaffold on a more individualized level); how willing you are to engage in a true exchange with your learners and ultimately, how you see your teaching role. Finally, coming back to the whole issue of coursebooks and de-skilling the profession. I think it all depends on the culture you´re immersed in and teach in. In Brazil, coursebooks are an expected element of the foreign-language learning context. The language institution where I work at is fairly typical of some in Brazil, in which learners probably start with us aged 9 and leave when they are 17, having completed the Cambridge ESOL CAE examination. Parents would throw a wobbly if we simply turned round to them and said, “Right, as of now we don´t use coursebooks.” Culturally, it´s not on! Ours is still a very prescriptive culture and the general educational system does a lot of spoon-feeding. Any change which moves away from the “traditional” requires time. I would also tend to agree with Jeremy that coursebooks can indeed provide less-experienced teachers with a backbone: they can provide a guide as to “how” to go about things. So they are scaffolds in their own right for teachers, who find support in the sequencing of activities, the instructions, the provision of worksheets and the activities themselves. Do they necessarily de-skill teachers? Well, I think that anything which is used without questioning can “dull the senses”…so I actively encourage all teachers using coursebooks to remember they teach learners. When we interact with learners funny and wonderful things happen (or fail to happen), so the book is only the tip of the iceberg really. But I have yet to see a coursebook which actually helps in terms of scaffolding in the sense of the emergent dialogic needs of learners and teachers. So that is why I think we need to really build up an understanding of a more pragmatic side of scaffolding in our training courses. It is highly desirable. Thanks for your post. Sorry for writing so much (I often do when I comment…sorry about that…). Thank you so much for this comment, Valeria, which is better in many ways than my original post! You and others here raise the very important topic of real listening skills for teachers: response-ability. I was going to blog about that over the weekend but Jason Renshaw has beaten me to it: http://jasonrenshaw.typepad.com/jason_renshaws_web_log/2011/11/teaching-is-seeing.html ! I will probably still follow up on this but I recommend Jason’s post too. I’ll probably end up replying to your comment more as a post than a comment here, so thanks again! Hi Anthony, please, video snippets of your unplugged teacher training and teaching would be very great to see. First of all, I’m not keen on Layla either, a song written about someone else’s wife and a riff written by someone else. Many times you have mentioned using trainees past experiences on your course. This guy had some great things to draw on and is probably a very interesting person but would he be accepted as a teacher with just a 4 week certificate? I ask this as from teaching in Asia I’ve seen a mixture of young uni grads and older retired people. All start teaching for one reason or another and some don’t even have the CELTA. Whilst the young ones are loved for being young and cool the older ones had been criticised from time to time for having had previous lives unconnected the teaching. I was once asked “do you know which teacher used to be a life guard?”. So what? If you change careers, retrain and work your way up it doesn’t matter if you did something unconnected before. What’s more, students often enjoy hearing about your ‘real life’ as opposed to someone who has only taught. Actually, when I worked on uni prep and corporate stuff the majority of teachers were ‘real business people’ and not teachers.as they knew the topic and had experience.The same at my current uni. In these situations experience takes priority. So, should we be judged on our qualifications, teaching experience or also on our pre-CELTA life? Yes, Phil: what constitutes (face) validity for a teacher? Does having a previous life – other work experience, non-teaching related qualifications, or even simply a few more winters in the world than your students – make you more acceptable as a teacher, or less? The reaction you describe in Asia is, interestingly, the polar opposite to the one I experienced in Germany, where youth is not automatically trusted, and age and other life experience is positively viewed. I recall students being quite shocked to learn how young I was when I first arrived (about 25, with 4 years or so of teaching, plus QTS in the UK); it simply did not fit their local expectations for how long such things take (especially for men, who had a compulsory military/social service year to do, as well as starting school later and taking longer about it and university than we do in the UK – I was basically 5 years or more ahead of what they considered feasible, and this naturally led in one or two cases to initial scepticism, if not to say distrust. Some of the best loved (by students) teachers I’ve worked with over here are actually approaching or well past “retirement age”, with a wealth of life experience as well as their years teaching. Granted, they tend not to take classes at MTV, but I suspect they wouldn’t want them. On the other hand, we have (at the moment) a raft of great young teachers, many of them freshly qualified (with us: nowt like growing yer own!). Some of these are fresh from university, others have some work experience. 1) will an intitution offer him work? I think so, if they know what’s good for them. A teacher doesn’t need an academic background or youth to be effective; but they do need nous, grit, a work ethic, devotion to duty, compassion, loyalty, humbleness and pride in their work. He has these qualities in spades. 2) Will his students accept him as a real teacher? No less so than they accept me, I suspect – I still get asked occasionally in the “normal” classroom what my job is – when I say “your teacher”, some ask “no, I mean, what do you really do?”, as if ELT were a form of charity work! I can’t help but laugh, and they then do too. During training courses, trainees sometimes suggest that the teaching practice students don’t look at them as real teachers – but if you ask the students, they say exactly the opposite. And these are students who know that their “teachers” aren’t “real” yet: but they invest them with this status in spite of this. 3) Will he view himself as a teacher? That isn’t for me to say. Based on watching him at work, talking to him about his teaching and his thoughts about the work, I see no reason why not. Thanks for the question Phil, though I don’t feel that I have answered it! If I haven’t, I’m sure you’ll let me know and we can go on from there, eh? As usual, you’ve answered it and more, always making us think down new avenues of EFL investigation. Yes, Asia was a bit strange at times as young kids were seen as great and very old people were given respect but then at 70 kicked out due to visa reasons. One of them became a good friend and he only decided to become a teacher at 65 when his wife passed away. After a couple of years of gardening he decided to fulfill a life long ambition and go abroad. He may not have had a CELTA but he could teach well and gave amazing examples and stories. Also, having helped his kids and grandkids through school and uni he knew what was needed to write essays etc. What I like about EFL is there is space for everyone and having all these people with different experiences makes it interesting. The ‘not a real job’ thing really annoys me, so does the “just plan the first year and repeat, it’s easy” argument. I think something needs to be done about supporting TD in the industry and experience and qualifications being valued with suitable jobs such as senior teacher or TT. Yes, it’s easyish to get your first job but where then? What I find really bad is when people say “you have a lot of experience but not in this country/industry” and use it as an excuse to pay you as a NQT. I can feel a new blog coming on as an excuse to moan about this. If the DELTA is now being heralded as equiv to an MA but with so many people doing MAs (as they are getting cheaper) will the DELTA be needed soon?